Robert E. Howard Days: Robert E. Howard Days Info Page Up and Running! 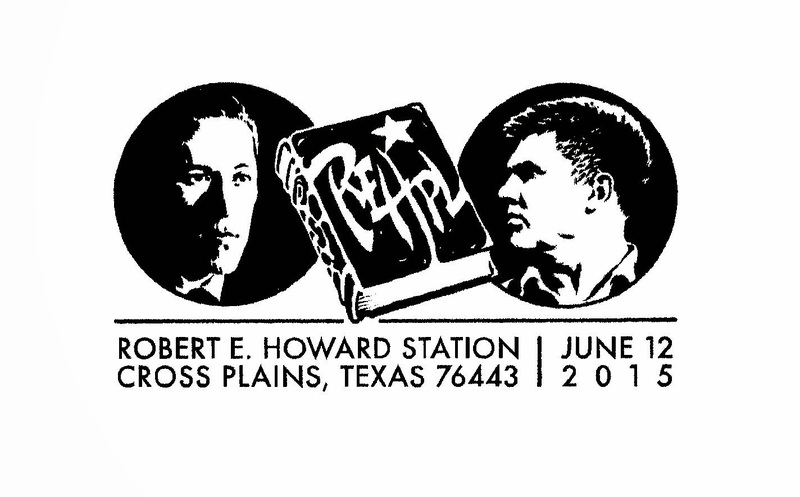 Robert E. Howard Days Info Page Up and Running! The Howard Days Information Page is currently up and running over at www.rehupa.com. We'll be posting it in segments here just to keep interest going! You will see all of the familiar activities are still in place, including the very nifty Postal Cancellation Stamp shown above, designed by our Guest of Honor, Mark Schultz. This is always one of the neater souvenirs from any given Howard Days, because each one is unique and you really need to be at Howard Days to get this cancellation done at the Cross Plains Post Office. This year we've added a Bus Trip to Howard's grave site in the Greenleaf Cemetery in Brownwood. That will happen on Friday afternoon and we promise to have you back in time for the Celebration Banquet! So check out the info page and hopefully it will entice you to come to Howard Days! It truly is The Best Two Days in Howard Fandom! The Official REH Days Flyer!